Today at Providence Park (Portland, OR), MLS Rivalry Week saw the Seattle Sounders FC take on the Timbers. A severely depleted Sounders squad could not overcome a spirited Timber 11. The Sounders rolled out a more familiar lineup including Andy Rose and Michael Azira at Midfield and Tyrone Mears at Right Back. At forward, however, the Rave Green are still without Clint Dempsey and Obafemi Martins–Chad Barrett and Lamar Neagle filled in for their stead. At the 8 minute mark, Marco Pappa got a great look at the top of the box (off a deflected ball). Unfortunately, the splendid opportunity saw a complete misfire . The Timbers may have seen some flaws in the sounders as the Timbers took 3 early shots from outside the box; including a goal by Midfielder Darington Nagby at the 12 minute mark. The Sounders defense looks confused by the Timber’s strategy. At the 17 minute mark, Gonzalo Pineda earned a touch foul that manifested in a booking. The yellow card seems a little ticky-tacky compared to the events of the US Open cup last week. With a hard Portland foul in the 23rd minute, knocking Andy Rose to the dirt, we saw the Timbers get away with a mugging. A pair of Timbers hard fouls on Lamar Neagle and Marco Pappa shows the referee was severely inconsistent. A foul on Pappa lead to a set piece. At 38 minutes, Tyrone Mears lobbed the free kick into Lamar Neagle who beat his man and the goalie for the equalizer. By halftime, the Timber’s aggression showed via 11 shots on goal (6 on target), compared to the 3 shots on goal by the Sounders. The rough play continued, culminating in an Andy Rose Yellow card; later we would see Neagle get a mysterious booking too. At the 52nd minute, the Timbers had a corner kick and the MLS Saves leaders, Sounders Goalie, Stephan Frei made an amazing one-handed save; a save that will undoubtedly be seen on the nightly news. Coach Sigi Schmid introduced a couple of substitutions in the second half. A fatigued Chad Barrett (who hadn’t seen the pitch since the NY Red Bulls Match) came out of the game (60′) for Andy Craven, a new acquisition as of Saturday. The Georgia native, had 5 goals this year for the Sounders minor league team S2. At 23 years old, Andy is the 1st Sounders call up from S2. Schmid used his next sub and former UW Husky Christian Roldan came in (69′) for Midfielder Andy Rose. Disaster struck for the Rave Green in the 75th minute as a complete defensive meltdown saw two Timbers goals back-to-back by Striker Fanendo Adi. One a chip shot from 16 yards out and another less than a minute later from 18 yards. 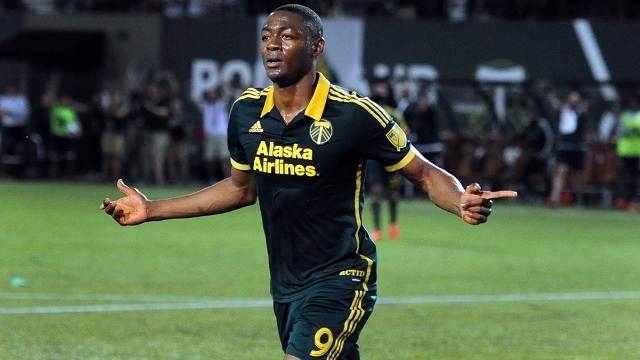 The goals were Adi’s 7th and 8th goals on the year. To add insult to injury, in the 91st minute, the Timbers Midfeilder Rodney Wallace got in on the goal parade with his 1st goal of the season, and the Timbers 4th of the game. Lack of communication, poor defensive shape, poor midfield play and fatigue took their toll. This team had shown good fight and heart through 70 minutes. Giving up 3 goals where the cause is poor execution on your part and not superior execution on the opponents , is a sign that the resilience of the Sounders is fading. Ultimately, missing Osvaldo Alonso, Clint Dempsey, and Obafemi Martins were too much to overcome. Do not expect the Timbers (or any other MLS team) to cry over this. Great teams find a way to stay afloat; right now the ship is taking on water and we have run out of buckets. Fenendo Adi of the Timbers scored the go-ahead goal and an insurance goal in a minutes time to break the back of the Sounders. It is difficult to give this award to a Timbers player, but he played the full 90 with ruthless aggression getting the brace and the win for his team.